Ah… so this is where the beautiful people go for fish and chips. But you won’t find anything wrapped in yesterdays Tele here. Attracting Potts Point-princesses and plenty of media heavy-weights, The Fish Shop is the latest venture from Jeremy Strode and Justin Hemmes. The Fish Shop’s design has been inspired by seaside settings found in famous American favourites such as The Hamptons and Nantucket. 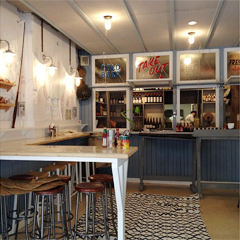 Accordingly, fishing paraphernalia such as hooks, lures and buoys are scattered throughout the restaurant space while diners perch (no pun intended) on high wooden stools at tables titled “Barra” and “Abalone”. Seashells line the restaurant’s walls and staff strut around in blue and white striped Jean Paul Gaultier t-shirts. All in all, the fit out is kitsch and fun but it is hard to avoid the feeling that it is a little forced. Mind you, subtlety isn’t exactly a Merivale strong point. While the decor is about as subtle as a slap in the face with a wet fish, the menu is multi-directional. If you hadn’t already guessed, seafood is the focus however dishes such as chicken and cabbage dim sim and Dan’s cheeseburger can be spotted on the menu. The end result, however, isn’t entirely disappointing. Cuttlefish with garlic, chilli and parsley is simple and full of flavour, while whole prawns are fresh and served with a top-notch smoked garlic aioli. Sending out that casual DIY vibe that maybe Jean Paul Gaultier uniforms don’t, cutlery is stored in Val Verde diced tomato tins on the tables, complete with a range of condiments including retro metal salt shakers and glass bottles of good-old Fountain tomato sauce. If you’re looking for a Jeremy Strode-standard meal, book into Bistrode CBD however if food is more of an afterthought, head to The Fish Shop.